Here’s a fun little surprise for you. This year I’ll be writing a regular column for Sew News magazine, and in each issue I’ll be talking about bridging the gap between Fashion (with a capital F) and the real world, especially when it comes to sewing. How do big trends and changes in fashion affect what we wear in regular life? And how do you translate fashion trends for everyday wear? And should we even care? Is big-F Fashion really so important when you’re driving the carpool, working a corporate job, or attending school? In my first column for the February/March issue, I’m talking about the difference between fashion trends and fads and about the continuing popularity of color blocking in fashion. (It shows no signs of stopping!) There are so many ways you can add color blocking to your own sewing projects, and in my column I’ve shown some examples from the runway to inspire you and help you to think about how you might translate what you see into something that you would feel comfortable sewing and wearing. In future columns I’ll be talking about developing a core wardrobe that all works together so you won’t stand in front of an over-stuffed closet in the morning with nothing to wear. I’ll also be talking about dressing to compliment your body shape and how you can use ease and volume in clothing to your advantage. I’ve already written four of the six columns, and it’s been so much fun to think up the topics, write about them, and sometime even do some illustrations to demonstrate what I mean. If you’re interested in subscribing to the magazine, it looks like you can also get digital subscriptions, for those of you overseas. I’m reading most of my magazines digitally these days because I can carry them around on the iPad. Except for Vogue, which I still insist on reading on glossy paper. Which is ridiculous when you see at the size of the September issue. Backbreaking. Great news! I must limit myself to 3 sewing mags( Vogue, Treads, and SewNews) since I am easily carried away, along with my budget.. Personally I cannot enjoy digital ones since it strains my eyes, but I do so enjoy my hard copies. Looking forward to your spin on making runway fashion something for the rest of us. Wonderful! I can’t wait to read your column. I too am reading magazines on a tablet, even Vogue. I love it while I exercise on the elliptical machine. How exciting! I can’ t wait to read your articles! So if you buy a digital subscription, do you print any patterns they might have? I don’t love getting my magazines digitally, but I hate putting a ton of magazines in the recycling. Also, digital products don’t take up room on my shelf. 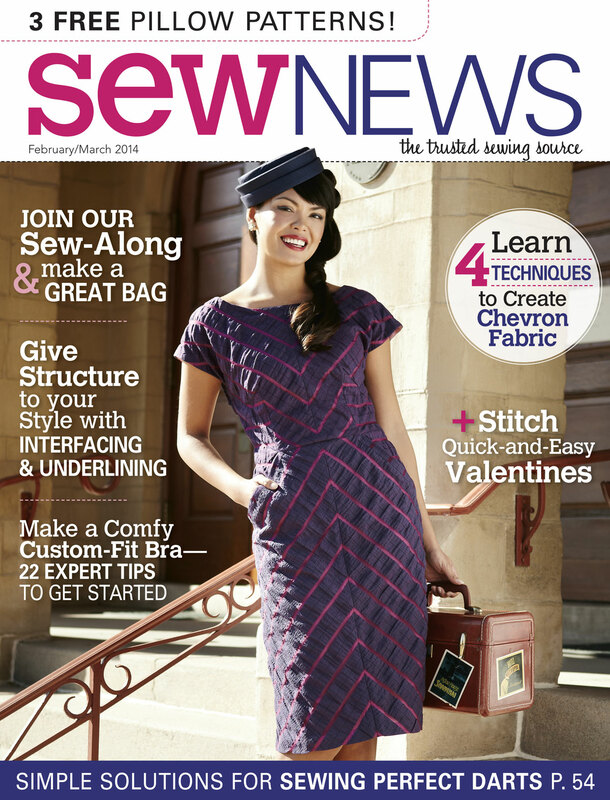 I just got my latest issue of Sew News. I saw your column. I was happy to see you in the magazine. How exciting for you! I’m looking forward to your upcoming article on a core wardrobe. Are you still doing your column for SewNews (2015)? Absolutely, Rebecca! My column is in each issue. Thanks for asking! Oh, that’s so sweet! My column only goes through the end of the year, but you’ll still be able to read a few more before it’s done. Thanks, and enjoy!